In the Wendy House, road-trip excitements builds. 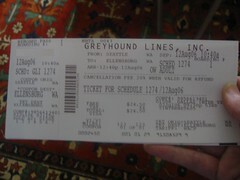 The first stage Greyhound ticket has arrived. I have one outrageously oversized suitcase that can carry my tent, roll matt, sleeping bag, clothes for the week, wash kit and possibly even Flat Eric! All this is only half the check-in luggage for either bus or plane! The ‘C’ belongings will be hand luggage: computer, casio camera, cell-phone, chargers, connection cables, cash and cards…. This scribble was published on Friday, July 28th, 2006. You can follow any banter on this scribble with the RSS 2.0 feed. You can leave a response, or trackback from your own site.